For much of the late-nineteenth and twentieth century, Jews from the Sharkey County towns of Rolling Fork, Cary, and Anguilla attended services and performed life cycle events at Greenville’s Hebrew Union Congregation. As the Jewish population grew over the course of the twentieth century, community leaders began to explore the possibility of forming a congregation in the 1950s. Founded in 1953, the Henry Kline Memorial Congregation served the Sharkey County community for several decades. Although the congregation no longer exists, the legacy of a small community banding together to preserve their Jewish heritage serves as a source of inspiration for Jews living in other small communities. For much of Rolling Fork’s history, several Jews in the Sharkey County put in efforts to maintain Jewish continuity in their area. In the 1880s, Henry Kline arrived in Anguilla by way of the emerging railroad. Kline was unsatisfied with the dearth of Jewish educational opportunities availble to Jewish children in the rural area. To remedy this, he opened up his home the the children of the community and taught Hebrew lessons every Sunday. It wasn’t until 1953 that the community came together to worship together. Up until that time, observant Jews had to travel to 40 miles to worship in Greenville. Dedicated Jews that wanted a closer option like Mrs. William Klaus were instrumental in the creation of a Rolling Fork congregation. The first organizational meeting occurred at the home of Mr. and Mrs. Jack Grundfest; after that, the group began meeting at the parish house of the local Episcopal Church. It was good to hear a Union sermon that praised God without any sectarian tinting. We do need reminding at least once a year that regardless of our personal beliefs, we are neighbors who live and work together for our common good. By 1956, the Rolling Fork congregation became so successful that members sought to build a permanent house of worship. Local Jewish and Christian families donated money for a permanent synagogue building. Jack and Ike Grundfest built the temple structure in honor of their father, Morris, and their brother, Sam. The Congregation continued to thrive between the 1960s and the 1980s. Greenville’s rabbis continued to support its congregants through regular visits. Temple leaders came from the families of Anguilla, Rolling Fork, and Cary. Longtime Rolling Fork Mayor Sam Rosenthal, for example, served as president of the congregation. The temple became an established and accepted part of the larger Sharkey County community. Local football coaches used to rearrange the schedule around the High Holiday season so that the Jewish players could play in Friday night games. The Temple Youth group held cake and rummage sales to raise money for the congregation and conducted study groups. They also invited clergy from around the town to speak to them about their religious traditions. 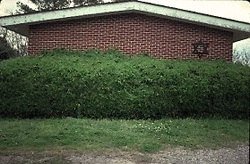 Due to changed in the Rolling Fork economy, the synagogue’s membership dropped signifigantly by the 1990s. The congregation finally closed its doors in 1992. The remaining Jews around Rolling Fork are active in Greenville’s Hebrew Union Congregation. “Temple Topics” Hebrew Union Congregation Newsletter, December 23, 1953.